These badges mean business! Not just applied affectation. 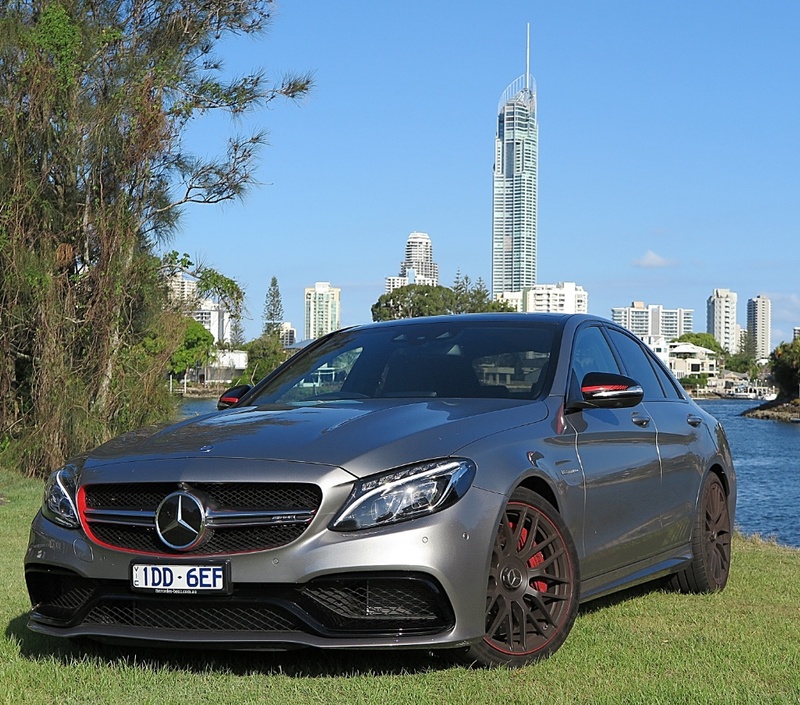 If you didn’t know it by its blood-red accents, sporty graphics and grey-black alloy wheels, then the moment the exhaust flaps open, the C63 AMG emits a marvelous growl to bellow its credentials. First the numbers, because there’s more important things to talk about. Cost? AUD$154,900. Power and torque? 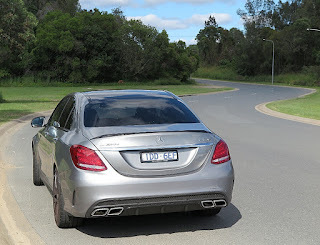 375kW @ 5500-6200; 700Nm at 1750-4000. Acceleration? 0-100km/h in just four seconds! 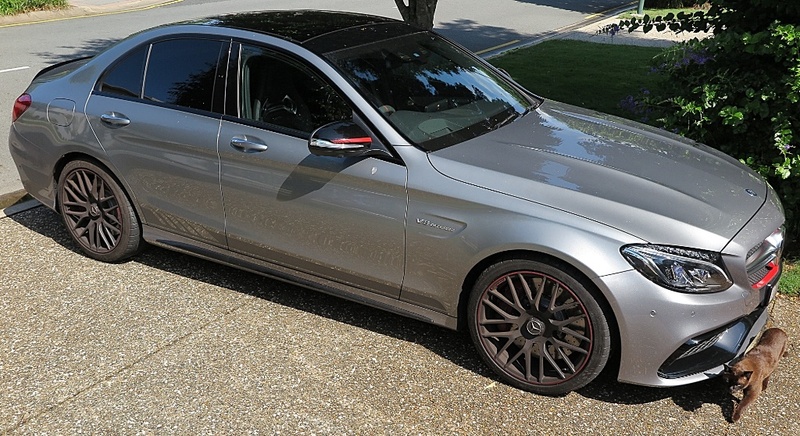 Stuffing a dry-sumped, twin-turbocharged 4L V8 into a new C Class shell means not only impressive performance, but also an invitation to explore just what makes this a great sports sedan. 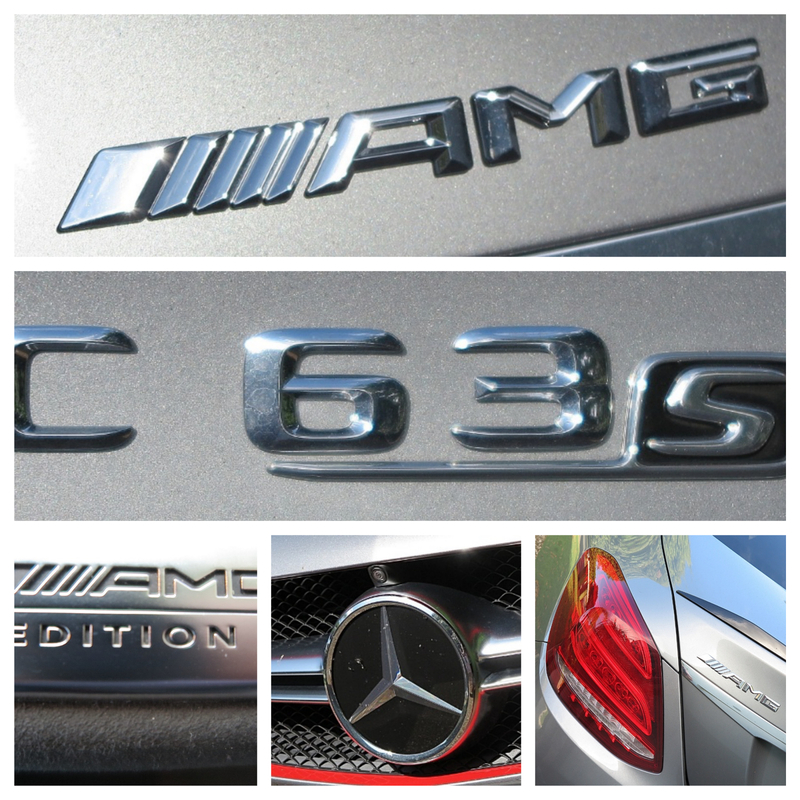 Firstly, it’s the investment in time, engineering excellence, materials, innovation, and the integrity of AMG’s values. 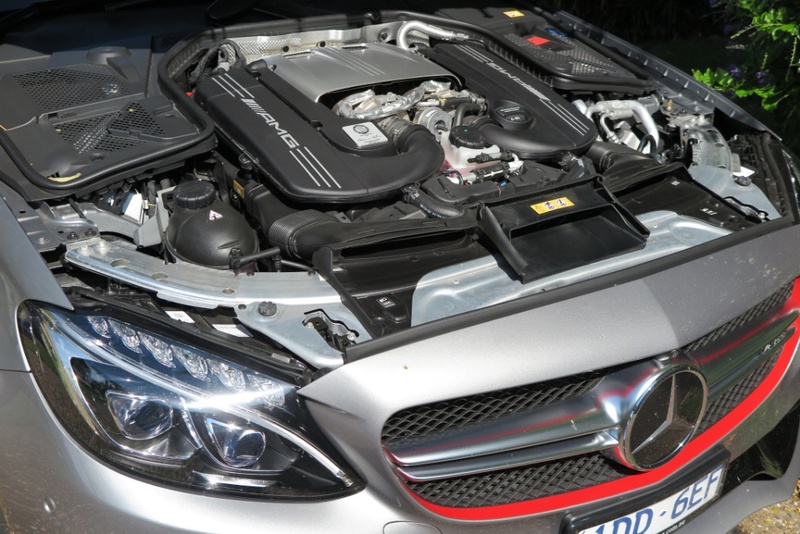 Designed and built in AMG’s facilities in Affalterbach, just 30 minutes north of Stuttgart, and in the middle of the 18th century former hunting grounds of the Württemberg family, this brand new engine, (M178) bears a striking family resemblance to the 2L engine in the CLA 45 AMG compact range. 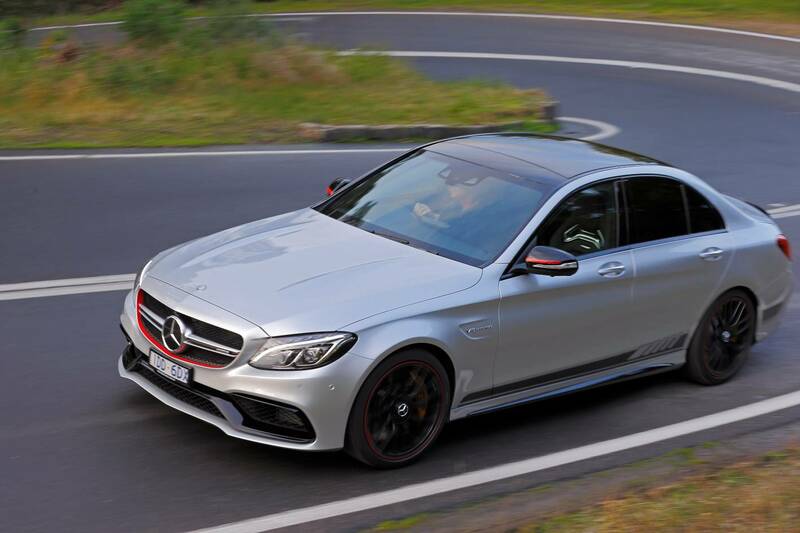 They share the same bore and stroke ratio, which means the C63’s new engine is just a doubled-up, grown-up version of the four cylinder unit. The M178 will also be the basis for a new range of engines to power all new Aston Martins from 2017. 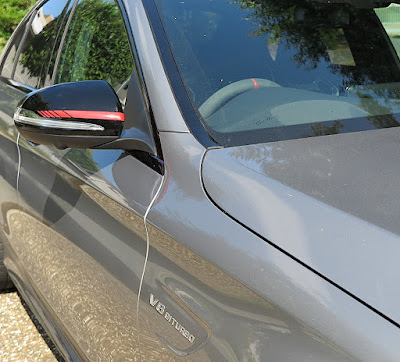 The C63 AMG bears the hallmarks of a premium European car, but actually reading the details of AMG’s development work on the V8 biturbo is more impressive than all the sporty/luxury flim-flam. The new AMG V8 engine has two turbochargers, which are not mounted on the outside of the cylinder banks but rather inside the V configuration – experts call it a 'hot inside V'. The benefits are a more compact engine design, an optimum response, and lower exhaust gas emissions. Dry sump lubrication allows the engine to be installed lower, which moves the centre of gravity closer to the road and forms the basis for high lateral acceleration. The aluminium crankcase is produced using sand casting technology and features a closed deck design. This ensures extreme strength whilst keeping the weight as low as possible, and enables high injection pressures of up to 130 bar. The cylinder bore surfaces feature NANOSLIDE technology which makes them twice as hard as conventional cast-iron linings. NANOSLIDE was developed by Daimler starting in the year 2000 and has so far been used in over 200,000 engines since 2006. 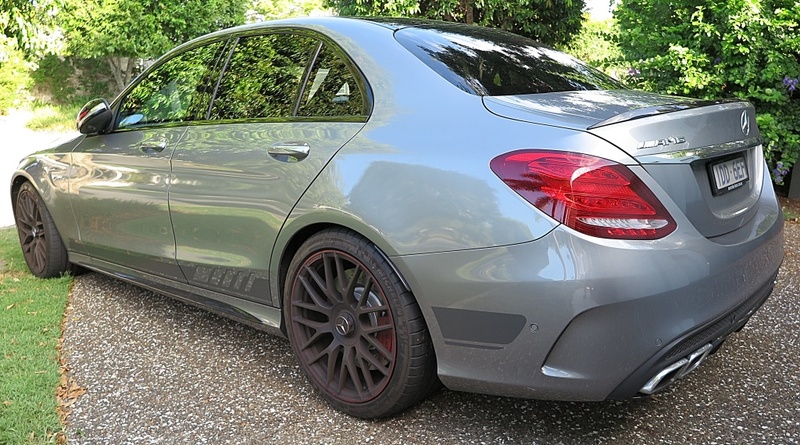 The first unit with NANOSLIDE technology was likewise an AMG V8: the extremely successful predecessor to the new AMG 4.0-litre biturbo. The application scope for this multi-award-winning technology has been continually widened. Since the start of the 2014 race season it is also being deployed in the new Mercedes F1 V6 turbo engine. 'Spectacle honing' is another measure to reduce friction and therefore consumption: in this complex process, the cylinder liners receive their mechanical surface treatment when already bolted in place. A jig resembling spectacles is bolted to the crankcase in place of the cylinder head mounted later. Any cylinder warpage that might occur during final assembly is therefore taken into account or eliminated as the cylinder liners are honed. This has advantages in terms of both durability and oil consumption. 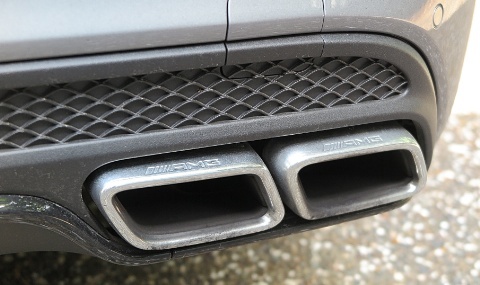 The new AMG V8 has forged aluminium pistons featuring a lightweight design and high strength. A low-friction piston ring package further reduces fuel and oil consumption. The cylinder heads are made from very expensive Zirconium alloy, for maximum temperature resistance and thermal connectivity. If you're thinking, a big, powerful V8 engine like any old 350hp Windsor or Cleveland cast iron lump churned out in Mowtown, think again. 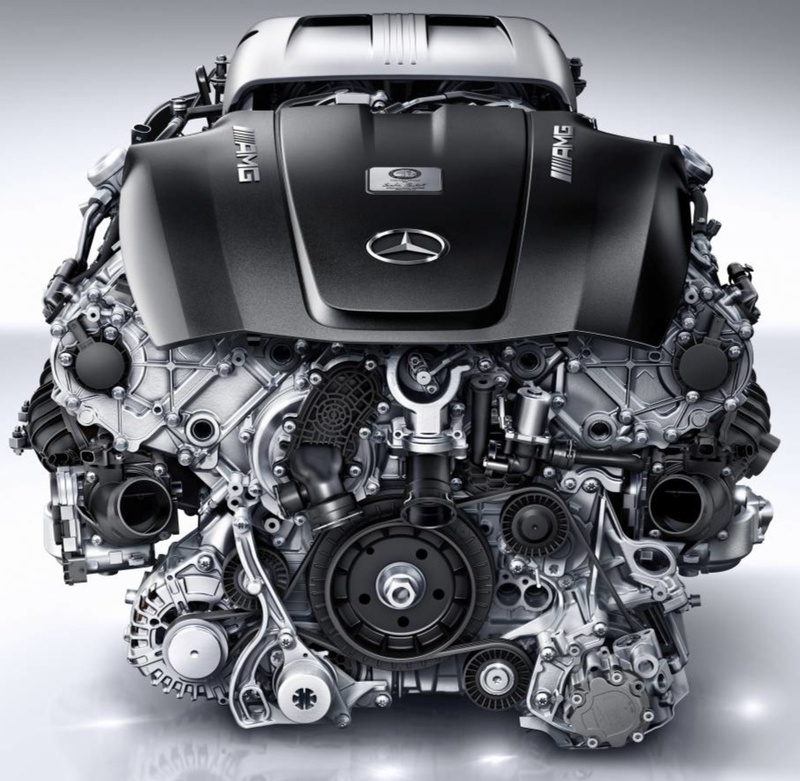 The sophisticated AMG engine was expensive to design, develop, build and test – and that’s why it delivers such impressive stats. Not just efficient power and torque; but compact design, light weight, advanced materials, innovative solutions and a racing pedigree. 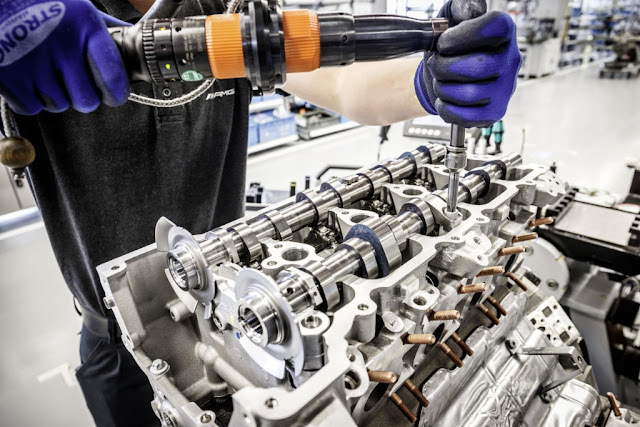 There are a range of techniques, applications and improvements which have flowed directly from AMG’s championship-winning Formula One engine developments. The most obvious evidence of its breeding is when you let the C63 AMG loose on the road. Plant your foot and there’s absolutely no turbo lag. The exhaust growl, just like the suspension and engine settings, can be manipulated by the driver to cover everything from comfort to sport, sport+ and even race! The handling is astonishing. The cornering stance is so flat it urges adventurous approaches to all corners. It can get a bit 'squirrelly' if power is applied at the wrong moment, but it's always controllable, ultimately thanks to electronics. The Sport, Sport+ and Race settings will rattle your fillings loose, so I just used 'Comfort' and believe me the handling remains astonishing. But that’s where passing my subjective evaluation on this car proves difficult. 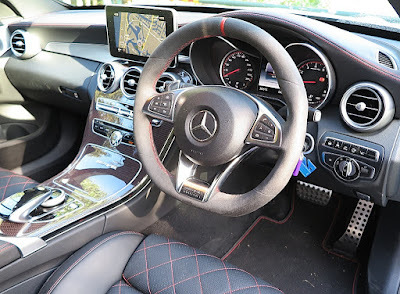 Yes, it’s got race car features oozing from its bloodline, and the silky-smooth Mercedes-Benz designed and built 7-speed multi-clutch transmission is a delight, but there are reasons why I wouldn’t be investing in a C63 AMG. The number one reason would be the really dumb steering wheel design. Okay, with a squared off bottom it looks the business, but its stupidly thick rim has been covered in fashionable, slinky suede leather, which makes it impossible to grip in one position for any length of time. 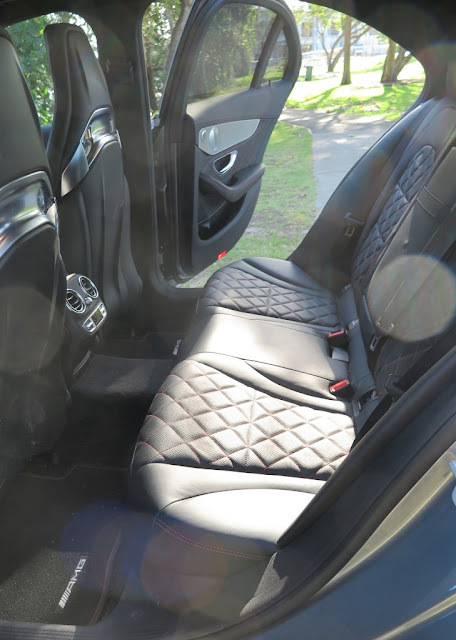 Unlike regular leather, your hands are constantly sliding along the surface, a problem accentuated by not being able to get your fingers around the wheel rim. Try steering through a long series of S bends quickly, and you’ll be fighting to keep a grip on things. I could not face driving this car every day with that steering wheel. Second, forget about fuel efficiency and low carbon emissions. That’s the price you pay for performance on tap at the blink of any eye. Official fuel economy figures, maybe recorded from the combined test cycle on a bench in Affalterbach (or at a constant 100km/h on a flat autobahn) suggest 8.7 l/100km. Forget it. 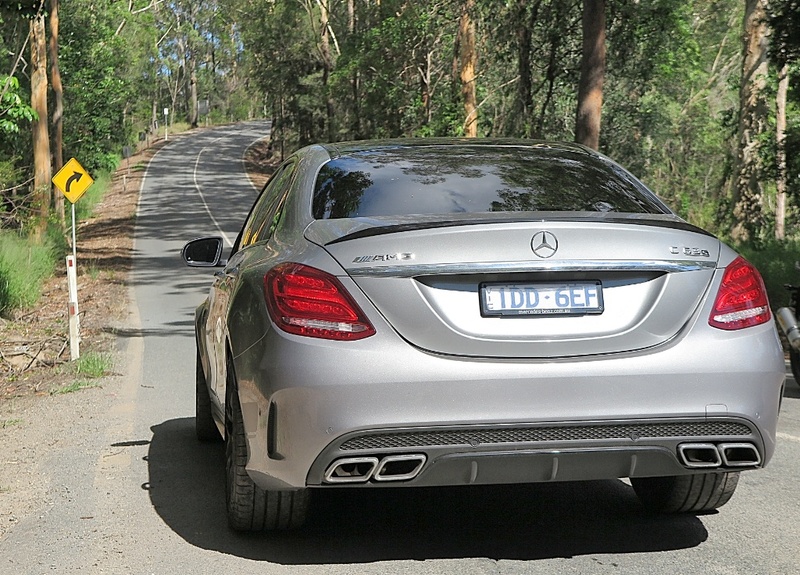 You might get that number coasting down a hill, but try 12 -14 l/100km in normal use. Then there’s the emissions. I’ve mentioned before on this Blog that the ‘magic number’ all car companies are trying to reach is something between 90-100 g/km. This little bitumen blaster produces 200 g/km. Not exactly environmentally friendly. However, lets face it. If you want a grown-up, German-bred, premium-priced European sports sedan with genuine performance credentials from a respected engine and car maker - then the C63 AMG, warts and all, is for you.